In the full game, you'll be able to detach a gun ship from the stationary platform, fly it around, and attach to other platforms to access their guns and abilities. This week, I added the ability to detach from the platform, fly around, and attach to another platform (getting access to it's gun). I added some camera control, so the view moves as you aim. I tried some screen shake too, but it's been making me a little nauseous so I turned it off for now. Maybe I'll try to bring more of that feeling of impact and force by showing recoil on the ship, instead of through camera shake. During the game jam, I used particles as a shortcut for the background stars. I felt like this worked well for a stationary view, but with the ship flying around, I updated the stars. The stars look more colorful in the game than in this gif, but you can still see the twinkling and parallax effect. I think I need to be on the look out for a good video to gif program, to give me more options for the quality/color/frame rate. This week, I've been focused on things to make the game feel more physical. 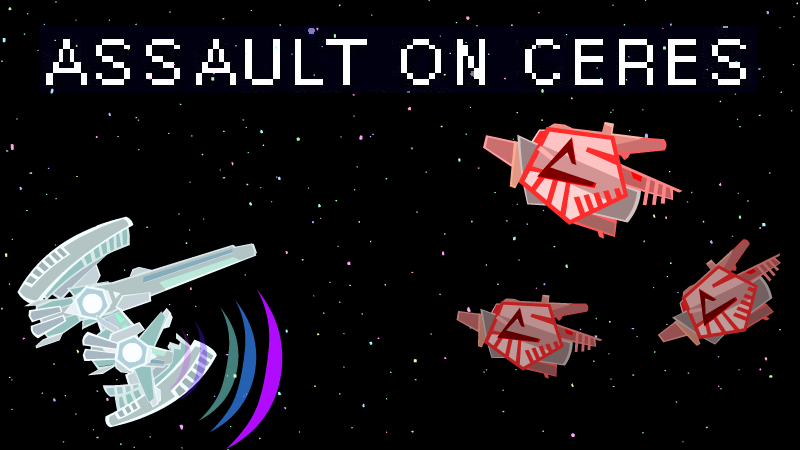 I've added debris to the enemy, littering the battle field with ship parts as they explode. I updated the bullets so they look better than the boring dots they were last week. I added a shooting animation to the gun, giving it some recoil and added light to the guns and platform when a gun fires. The light change on the gun was included as part of the animation, but the light on the platform was a bit trickier. Since the gun could be pointed in any direction, the light on the platform could also come from any direction. So I created a lighter version of the platform, and used masking to draw the lighter version over the darker version in specific areas. It's working well for now, but the way I'm doing it in GameMaker requires creating sprites on the fly every frame. I wonder if this will take it's toll on the games performance as it gets more complex.